We're continuing our way along the work week. We've come over the middle of hump-day yesterday and are sliding our way to the weekend. As predicted, my Wednesday did seem to take a while, but as I mentioned, that's hardly anything new. We'll see about making today and tomorrow go by quickly so we can get to Free Comic Book Day, Cinco De Mayo, and gaming! And if we're gonna be gaming, we should make your gaming tables look good. 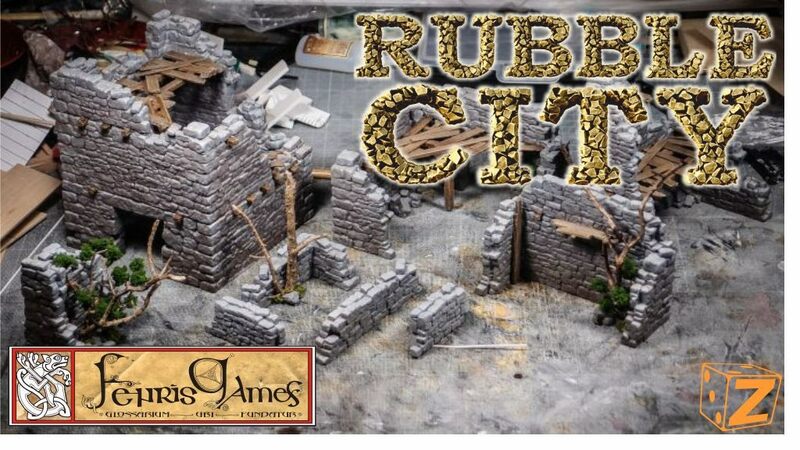 Today in the Terrain Corner we have: New Modular Bridges - Riffled From Tabletop Scenics, Fenris Games Running Rubble City Kickstarter, and Heroic Maps - The Giants' Cave Now Available. Amazing what a difference a week makes. Last week, I was lamenting how long it was all taking. This morning, I woke up and was like, "Whoah... it's already Wednesday!" That certainly works for me. Faster to get to the weekend, the better. But if we're going to be going along at this break-neck pace, we should stock up on some bite-sized gaming stories. Today on the platter we have: Lion Tower Miniatures Launch First Kickstarter, New Statuesque Asylum and Starport figures and a new Statuesque Female Head size, Battlefront Releases Range Finder For Flames of War, Exiles of the Tetsu Clan Miniatures Up On Kickstarter, New ellipse bases from Micro Art Studio, New Norman Kite Shields Available From Tabletop-art, Fenris Games - Rise of the Draugr Up On Kickstarter, Battlefront Releases New Destroyed Markers For Flames of War, Broken Egg Games are coming to Europe, New Quad Mortar Platform Available From Kromlech, Acheson Creations and Evil Bob’s at Cold Wars March 17-19, New Desert Mission Token Set From Battlefront, Ouroboros Miniatures presents: Fey- The Celestial, and Atlantis Miniatures Launches 28mm Dwarf Minis Kickstarter. 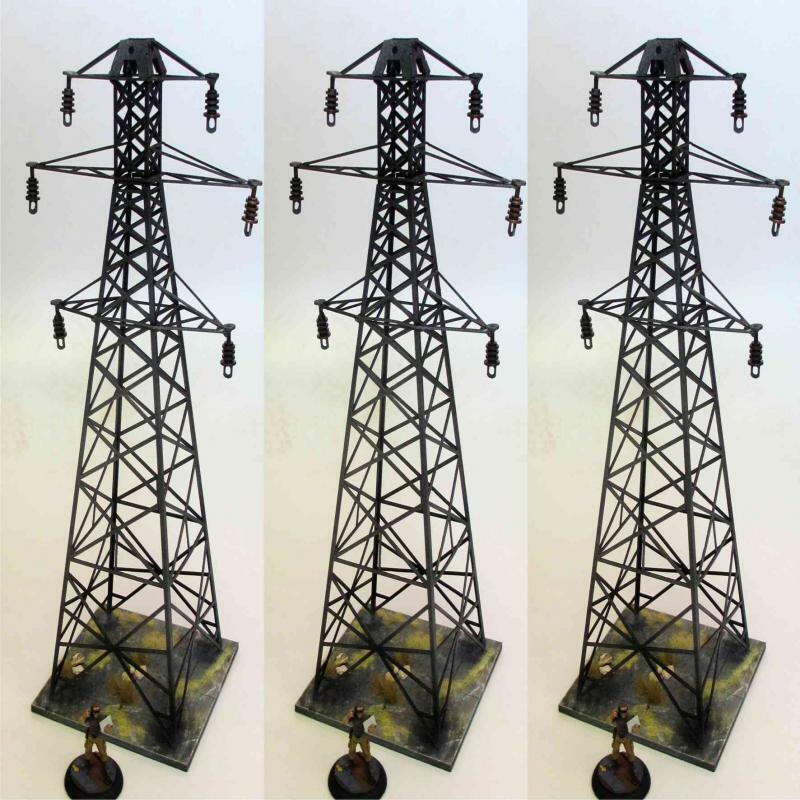 Fenris Games gives you some more options for your tabletop terrain with their new power line towers (or electricity pylons, if you prefer) over in their webshop. New in the webshop - electricity pylons (or transmission towers, if you prefer!) - 94 piece laser-cut kit building a 280mm tall tower that'll suit anything from pre-war (based on a 1930s design) to post-apocalyptic and near future. Available singly or in sets of 3 for bigger gameboards. Fenris Games has started taking orders for their new H.P. 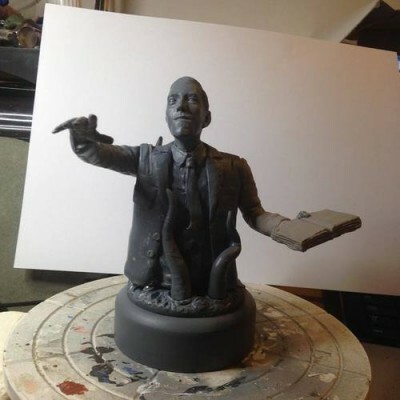 Lovecraft bust they've been working on. Phil Hynes has sculpted a cracking 1/6th scale bust of old longfaced HPL himself and it's up in our webshop at a pre-order reduced price. 9-piece, 110mm tall kit with an 80mm diameter display plinth. Fenris Games is taking orders before Crisis and giving you a discount if you do so. With over 925 items now in the webshop there's not a hope in Hades of us bringing everything we produce to even a big show like Crisis - so the only way to ensure we have what you need is by grabbing a pre-order now. We're offering up to 20% discount on large orders and obviously there'll be no postage either ! Fenris Games has posted up some preview shots of a ceratops mutant warrior they're working on. Coming soon - ceratops mutant warrior(s) by Snuurg. Three variant heads, alternate weapons. 50mm+ tall (depending on head) big resin beasties. 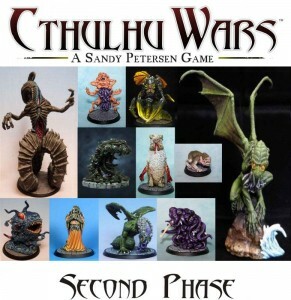 Fenris Games has their 2nd wave of Cthulhu Wars singles available over in their webshop. 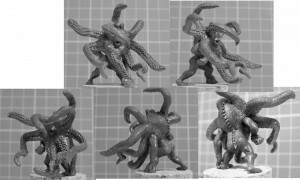 We've released the second batch of individual models from the Cthulhu Wars game, including big C himself, as well as Nyarlathotep and assorted SAN-reducing critters. All this and more on the new, much-improved website. Fenris Games has their brand new website up and running. Go check it out. 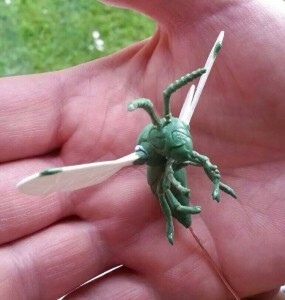 Fenris Games shows off the green for their Giant Hornet they'll be shipping out soon. I feel like Al Hirt should be playing. Finally found the time yesterday to make the moulds for the new Giant Hornet model - hopefully starting casting later today ! Fenris Games and the Lazy Forger have some new releases available to pre-order from off of the Fenris Games' site. 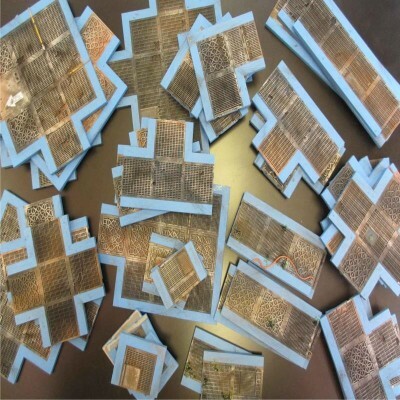 We've just struck a deal with popular architectural modeller The Lazy Forger to sell several of his 28mm scenery pieces. Walls, elevations, roofing materials and medieval machineries are all among the first releases, and are available at reduced prices on pre-order. 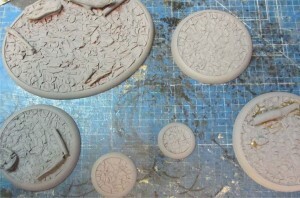 Fenris Games is showing off this preview photo of a new line of bases they're working on. WIP on a whole new base range: Cursed Earth. Fenris Games is showing off this preview WIP of Chaugnar Faugn. 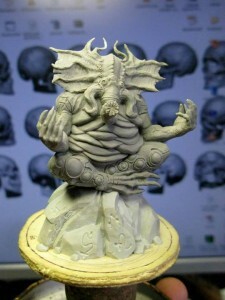 Monday morning, and more Cthulhu Wars WIP sculpting. This time, everyone's favourite elephant-headed, flab-encrusted yoga teacher....Chaugnar Faugn. 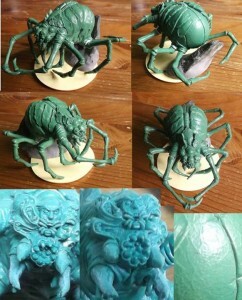 Fenris Games is seriously giving off the heebie-jeebies with this latest green. Check out the Atlach-Nacha. 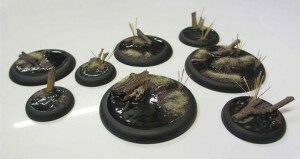 Fenris Games adds more basing options to your modeling toolkit with the release of their new Darkmere bases. All-new Darkmere swamp bases, DS profile, deep recess for adding water effects, with sandbanks, treefalls, and animal remains. Fenris Games is taking down names of those of you gamers who want to get their upcoming Derrick terrain piece as soon as it's available. We're adding another piece of laser-cut industrial scenery to our range - a companion piece to our nodding donkey, Clive. 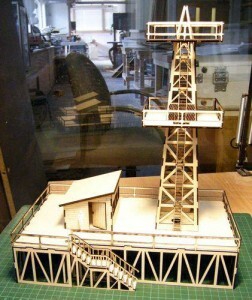 Scaled for 28mm gaming, this picture shows WIP but the finished kit should be available in June. Pre-order now for at least 15% off final list price. Fenris Games is headed to Salute next weekend and will be bringing some new terrain pieces with them. We've got a couple of new laser-cut kits ready just in time for Salute, and also available at pre-order prices in the webshop. 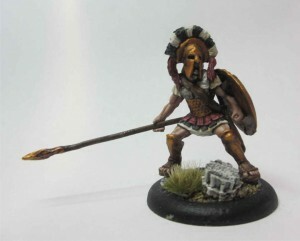 Fenris Games gives us a look at the Leonidas they're going to have in their upcoming Bronze Age line. 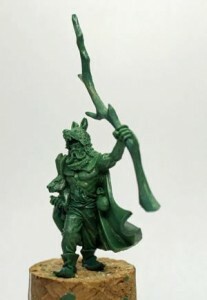 Another Monday morning....another painted Bronze Age mini from the starter range we'll be stocking very shortly. Fenris Games was glad for the service you guys did in helping name their "guy with stick" so they're doing it again, this time with a monster. Note: post your name suggestions on the linked page, not in the comments here. 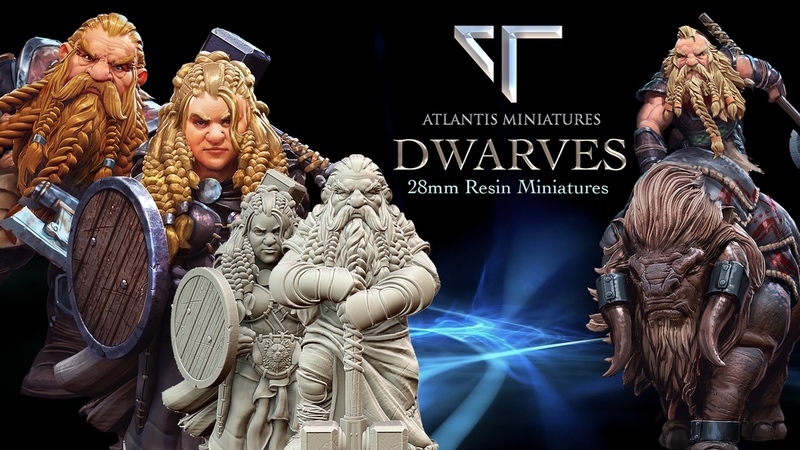 Fenris Games is another company looking for help in naming one of their game pieces. Theirs is more of a fantasy figure. What do you think he should be called? Tales of a Tabletop Skirmisher has had the chance to check out the Fenris Games Post Apocalypse resin bases range. Over the last couple of years I have been using the Fenris Games Post Apoc base toppers but I recently found out that they do the same designs in full bases. A set of these were up as a prize in the Paint the City Pink auctions and were won by Bubba Ho Tep from the Kentucy Fried Gamers Youtube page, as Bubba is a good friend I took some sneaky photos before sending them off. Fenris Games is also expecting the world to end, but just in case it doesn't, they've got a sale on their Loyalty card going to double your points. Today only, any Loyalty Card purchased in our 2013 reward scheme will be doubled in value for anyone brave enough to bet the future of the planet against massive savings on Fenris stuff next year. So, buy a £50 loyalty card, get £100 in credit for purchases throughout 2013. This scales across the range of cards - so the Platinum card will be worth £400 to any buyers! These limited Mayan cards will also gain their buyer double the number of entries into the end-of-year prize draw. On top of that, every order placed today for a Mayan Loyalty Card will get a free copy of our 120mm 2012 base, shown below - perfect for all of your apocalyptic basing needs - sent post free, anywhere in the world. Full details of the Loyalty Card Scheme and relevant costs inside/outside the UK are on our website. Fenris Games will be rewarding repeat customers again in the upcoming year. Following the success of this year's Loyalty Card (with a prize worth over £750!) we're running a similar scheme again for next year. Buy a card before the end of this year, and gain 30-50% discount on your purchases for next year, free master castings from next year's mini releases, and entry into the prize draw to win one of EVERYTHING we produce over the course of the year (worth at least £500 at a rough guesstimate).